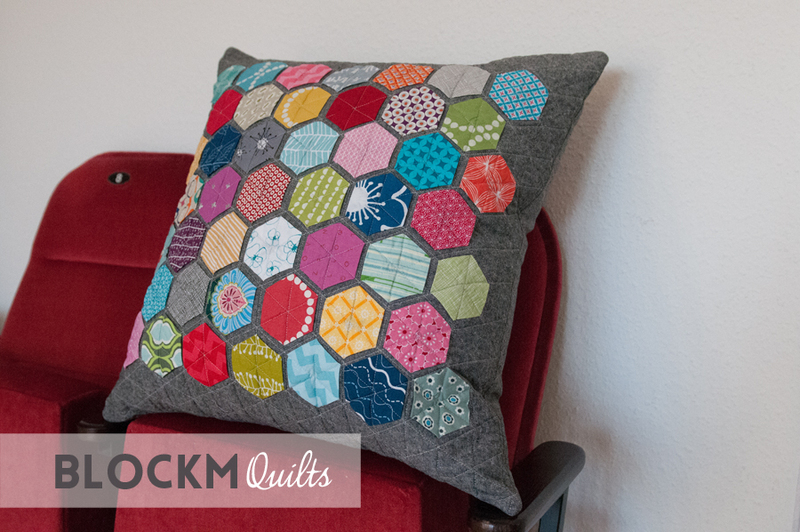 Today I want to share my first ever Hexagon project: a pillow! 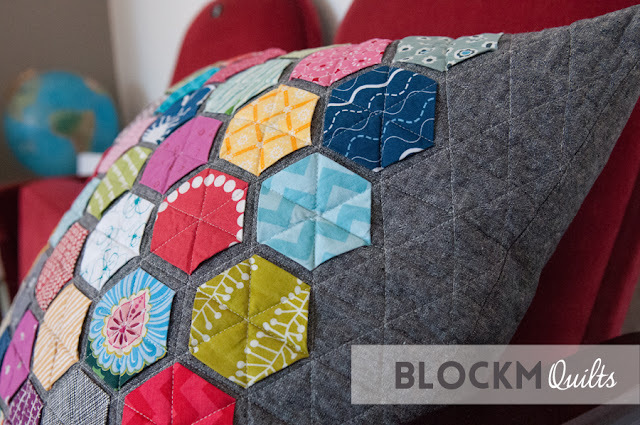 The hexies are made using the English Paper Piecing method (EPP). My hexie paper templates were a supplement with one issue of Love Patchwork & Quilting Magazine which I have subscribed. The hexies have a side length of 1.5'', the pillow is 23 x 23'' / 65 x 65cm big. I used my scraps in every colour you can think of. The backing fabric is Robert Kaufman Essex Yarn Dyed linen in black, which I love! It has so much depth and a great texture. 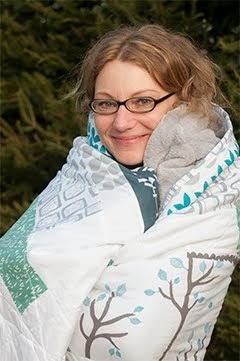 I quilted it in Aurifil 40wt #2600 Dove, which blended in nicely with all colours and the linen alike. 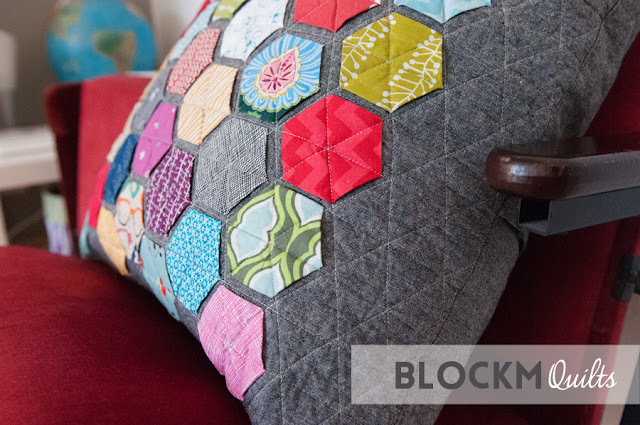 I have sewed the hexies on top of my backing fabric following this tutorial from Nicole of Modern Handcraft. I am the proud owner of two old cinema chairs. Ruby red velvety fabric, seat numbers 7 and 8, 8 being an end seat with an arm rest in stripy fabric. LOVE them! Great back drop for this lovely pillow. The pillow was a gift for a close friend of my husband and me, we are especially thankful for all her hard work. Our hexagons change all the time, hence all the different colours. This turned out really lovely! These are my favorite kinds of hexagons! Dein Kissen ist so wunderbar geworden. Die Kombination mit dem Grau sagt mir sehr zu. Ich hab auch mal so ein Kissen gemacht und weiß, dass das viel Spaß macht. Das sieht wunderbar aus! Vielleicht versuche ich es ja auch mal noch mit den Hexies. Im Moment stehen wir noch etwas auf Kriegsfuß, aber wer weiß? I love hexies - I love your pillow too. Wunderschönes Kissen liebe Daniela! Die Farben leuchte ja richtig auf dem grauen Hintergrund! This pillow is so great! Love it! So lovely. I love hexies, all kinds of. Toll gemacht und herzlichen Glückwunsch zum ersten hexie projekt!